Winelli: What kind of wine is it? How great is when a grape variety get a whole month to show what it knows! 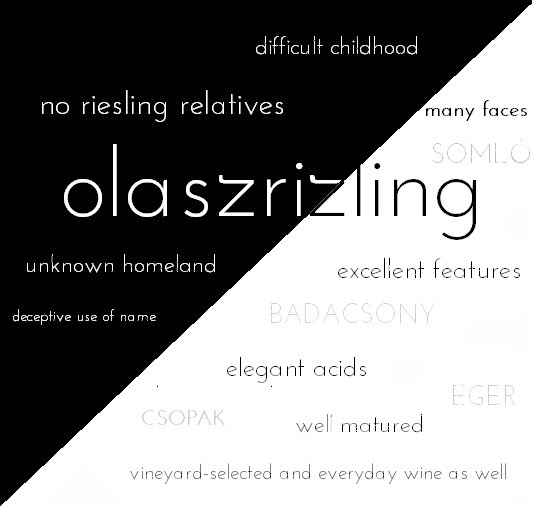 After February of Furmint an other wine is in the spotlight: Olaszrizling! If I translate, it is "Italian" "Riesling" but it is not related to Riesling, and its origin is contested. The grape is known as Welschriesling in Europe, but Wales is a blind track also. 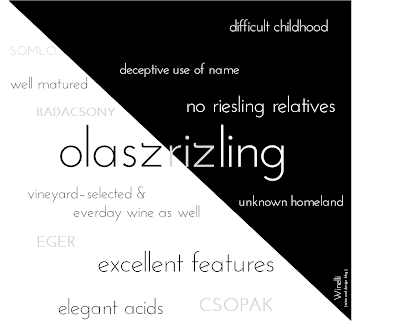 Grasevina, laski rizling are also its names in the Central Europe. For Hungarians it isn't so complicated, because it is grown on 4600 hectares (largest area cultivated white wine) and can be found almost every of our wine regions. The reason is after the phylloxera it is cultivated replace other wines, because has excellent features. I have been reported about virtues of Olaszrizling in an earlier post. "If you visit Hungary, you can find wine regions with different soils and climate only a few kilometers apart. That's why we love olaszrizling, because every one is a single universe." I took this photo in Badacsony Wine Region, from the Csobánc mountain. Lake Balaton is on the background, and Badacsony and Gulács volcanic cones. It is just one of the best growing sites of Olaszrizling, and what a beauty diverse, isn't it? The wine which can represent this beautiful landscape int our glasses, deserves attention for a month, or more.